Brian O'Driscoll believes Will Addison's "versatility" gives him an edge over Jordan Larmour for a place in the Ireland matchday squad ahead of the Six Nations Championship. Ireland begin their campaign at home to England next weekend and assessing the strength within Joe Schmidt's squad, O'Driscoll says Addison may be ahead of his Leinster counterpart in the pecking order. "You've got to have a mixture to your game," he explained. 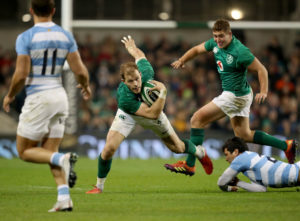 "There's an expectation to carry quite a lot in close quarters in Joe Schmidt's teams. "They'll hit up and use the centres to hit up again. So you have to be quite durable and you need to be able to pack a punch. "I'm talking about Addison, [Chris] Farrell, Bundee Aki, [Robbie] Henshaw and [Garry] Ringrose as the five vying for the four centre positions on the plane. "I think Addison is going to go because of his versatility." Jordan Larmour looks on as Will Addison carries against Argentina in the November Series. Larmour has impressed for Leo Cullen's side over the past 18 months and has emerged as one of Leinster's brightest young stars alongside Ringrose. However, O'Driscoll admits Addison's ability to adapt may be key to his inclusion in a matchday 23. "He can play wing. I think he could be recording the fastest times - I think it could be even quicker than [Jacob] Stockdale. "Of the centres, he's comfortably the fastest in straight-line speed. He's played wing in Sale, he's played full back a lot. "He's doing a great job for Ulster at 13. At the moment he's a shoe-in for the [World Cup] 31. "I think he could be included on top of the four. That's where he could be of big help to Joe Schmidt. But that'll be at the loss of someone else in the back three." He added: "I think now [Addison] is starting to push as a more viable option for the 23. I think he'll get into the 23 against England even though Larmour has been outstanding every time he's been involved in the squad. "I just think when you can cover three positions [you become more viable]." 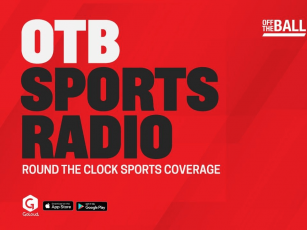 You can watch OTB AM's full Depth Chart Discussion above.